Canisius women’s lacrosse coach Allison Daley announced the hiring of former Binghamton standout Brianne Arthur as a graduate assistant coach with the Golden Griffins program on Tuesday. A native of Watertown, N.Y., Arthur will assist in the development and coordination of the team’s offense and transition game. She will also oversee individual skill development and assist in recruiting efforts, game scouting and academic success. Arthur joins Canisius after a standout career with the Bearcats that saw her tally 104 goals as she became just the fourth player in program history to reach the 100-goal plateau during her career. A two-time team captain, Arthur earned All-America East Second Team accolades as a senior, recording a school-record 45 goals during the 2018 campaign. She was selected to participate in the IWLCA Senior All-Star Game in June. Arthur has worked as a youth lacrosse coach in her hometown for the past five seasons, working with a variety of age groups during the summer. 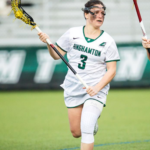 She was also active in the Binghamton community as a member of the women’s lacrosse team’s leadership program, helping organize various community service experiences throughout the year.